Fall is here in the Emerald City and that means Stouts. Everywhere you look, it seems breweries are preparing their annual Stout releases and, as much as I do love a good Stout, their abundance can sometimes overshadow the deliciousness of a good Porter. 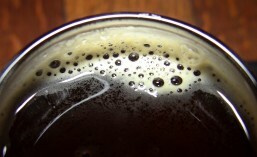 The differences between Stouts and Porters can be subtle and the debate over what the exact differences are continues. Basically though, Porters are a bit lighter in body and mouthfeel and sometimes, though definitely not always, can be slightly lower in alcohol. Essentially, all Porters are Stouts, but not all Stouts are Porters. Now that I’ve made things clear as mud for you, I’d like to tell you that one of the best known and best loved Porters in the Northwest, Alaskan Brewing Company’s Smoked Porter, is turning 30. Alaskan Brewing is preparing to celebrate with the opening of their expanded taproom this Saturday. Living in the South end and working the early hours I do, I don’t get to Ballard as often as I’d like. Thankfully, I can usually find at least some beers from a few of my favorite Ballard area breweries either on tap at some good, local craft beer bars or in bottles or cans. I love this time of year. I may be a serious hophead (I’ve been in hop-lovers Heaven this fresh-hop Season), but I think most of my favorite craft beers are still dark beers. When Stout, Porter and Winter Lager season rolls back around, you’ll always find me with a big smile on my face. Well, Black Raven Brewing Company (CBM Sponsor) is helping me out with that Winter beer smile. Just two weeks ago they released Grandfather Raven Imperial Stout. Last week they brought us Frost Beak Winter Lager and now, set for release this coming Saturday the 5th, is their Gunpowder Plot Nitro Porter. Brewed to commemorate Guy Fawkes Day, Gunpowder Plot is rich and complex. Brewed with bourbon-soaked coffee beans and cocoa nibs and served on Nitro, its a true pleasure to the palate. Are you familiar with the traditional English Porter, Samuel Smith Taddy Porter? It’s a classic example of the style and is even listed as one of the commercial examples for the style in the 2015 BJCP Style Guidelines (Style 13C. English Porter). Now, through a special arrangement with Samuel Smith, three Washington breweries have been allowed to brew tribute versions of Samuel Smith’s beers for Seattle Beer Week 2016. Black Raven Brewing Company (CBM Sponsor) has elected to brew a tribute to Taddy Porter. I think Porters are an under appreciated style since so many people seem to favor Stouts. I certainly enjoy a good stout myself but also seek out the occasional porter, so I’m curious to give this one a try.